Indy Eleven extended its win streak to two in front of a record-breaking crowd of 20,251 after downing Hartford Athletic, 1-0. A Hartford own goal late in the first half secured Indy’s second win of the season, bringing the club’s 2019 regular season record to 2W-1L-0D. “Really happy to get the win in our first home game of the season,” said Indy Eleven Head Coach Martin Rennie. “It was great to be part of the atmosphere and also the record crowd we had tonight." 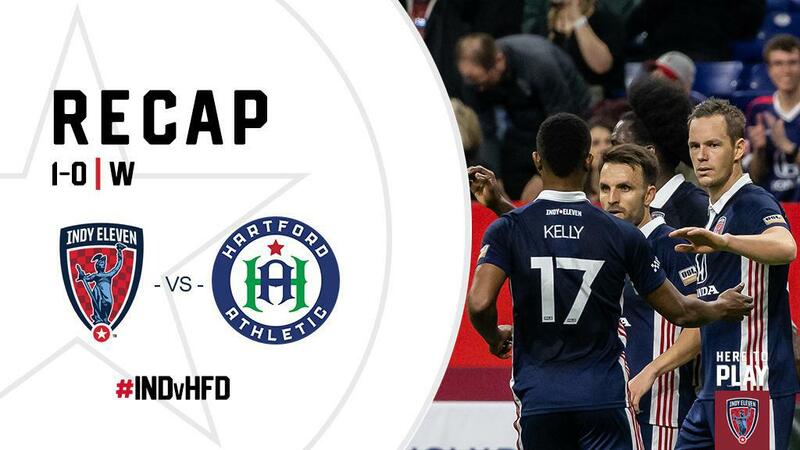 Hartford tried to spark the first goal of the evening when forward Jonathan Brown played a lofted cross into the center of Indy’s 18-yard box in the 11th minute. Eleven goalkeeper Evan Newton went airborne off his line to collect the ball before it could find Brown’s teammate. Indy Eleven forward Dane Kelly’s strike in the 15th minute was the first in a long list of chances for Indiana’s Team. From the center circle, fellow forward Eugene Starikov fed a cross to the Jamaican striker, who brought the ball down 30 yards from goal. Kelly moved the ball through the top of Hartford’s penalty box with a single touch to beat a challenging defender for a shot, only to be stopped by goalkeeper Jacob Lissek’s falling knee. Streamers fired from the Brickyard Battalion in celebration in the 23rd minute after Kelly tucked the ball into the top of the visitor’s net from a tight angle, but the linesman called the attempt offside as it flung into the goal. Brown had a similar attempt for Hartford in the 31st minute, but the ball once again found Newton. Starikov asked questions a minute later after heading down a giveaway by Hartford deep in the Eastern Conference newcomer’s defensive half. The Ukrainian-American’s strike off the prior deflection ended wide of Athletic’s goal. Starikov and strike partner Thomas Enevoldsen returned with back-to-back shots less than 60 seconds later, both of which were kept from finding the back of the net. The tides turned in the 40th minute, when a cross from Eleven defender Ayoze Garcia took a hard deflection off of Hartford defender Nikolaj Lyngø’s chest and passed Lissek for a clean own goal and a 1-0 Eleven lead. Kelly continued his onslaught of chances seven minutes into the second half when his shot slammed off Hartford’s left goal post. Lyngø sought after redemption from his prior own goal with a shot from distance in the 64th minute, but Newton did well to keep the scoreline skewed in Indy’s favor. Lyngø’s shot was one of only two on-target attempts from the visiting side. Kelly, the USL Championship’s all-time leading goal scorer, found the woodwork once again in the 90th minute after his shot from inside Hartford’s 18-yard box ricocheted back up the field. Kelly had accumulated six shots of Indy’s 17 on the evening, more than anyone on either team. Indy Eleven head into another bye week and will return to action in Week 6 on the road against Swope Park Rangers on Monday, April 15. Indy Eleven return to Lucas Oil Stadium to take on Tampa Bay Rowdies on Wednesday, May 1, at 7:00 p.m., followed by a second home match three days later against North Carolina FC at 7:00 p.m. Tickets are available for as low as $15 at IndyEleven.com/Tickets or by calling 317-685-1100. ©2019 Indy Eleven - USL / SportsEngine. All Rights Reserved.